This is the greatest picture of all time!!! I am on the flight deck of the Virgin Express 737-300 mentioned two pictures ago. We are at 35000 feet, somewhere over Strumble, Western England. There was an oceanic-bound jet about 15 miles ahead of us. We were about half a mile north of his flight path and could easily see his exhaust contrail. We were fortunate enough to also see his wake turbulence vortices beneath the exhaust contrail! They are caused by every aircraft's wingtips. In this position, I took a picture of this extraordinary phenomenon for further analysis (and for reference as the first time I have seen an exhaust contrail AT ALTITUDE). Use the 3X Larger link to get a closer look. 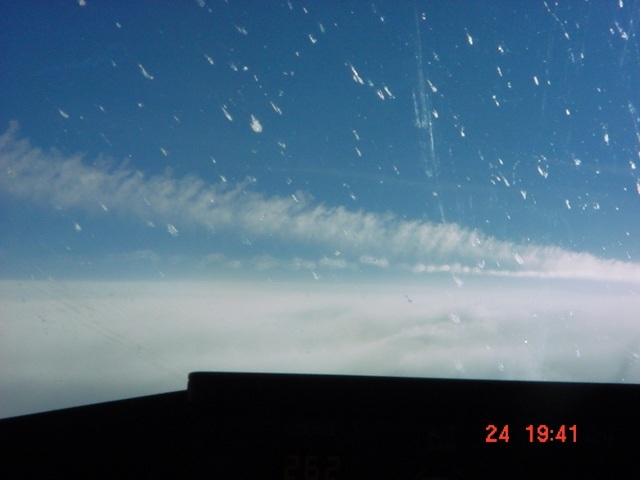 Concentrate especially at the vortices under the contrail. Just ignore the bug splatters on the windshield.